Our whole school community; students, faculty, staff and parents come together to pray and worship at Mass every Friday at 9 am. Students participate in every aspect of the Mass; as lectors, altar servers and choir members. In addition, faculty members serve as Eucharistic ministers. 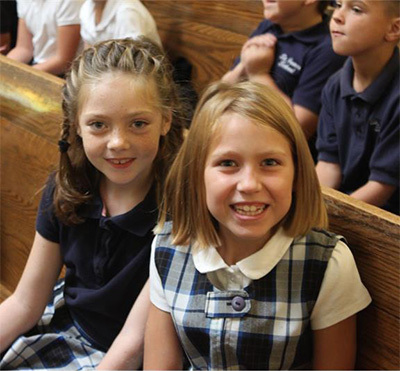 Each grade is responsible for one of the nine First Friday Masses, which have a theme based on the time of the year. Examples include: Saint Francis and the Animal Blessings, All Saints Celebration, Jesse Tree, Los Posadas, Saint Patrick, May Crowning and more. Students are responsible for the Bible readings, responsorial psalms, intentions, altar serving and offertory procession. In addition, at the conclusion of Mass the students often perform a skit to highlight the theme of their First Friday Mass.